"Archbishop Fulton J. Sheen: Servant of All" is a one-hour documentary that tells the story of Sheen and the tremendous impact he had on individuals, the Catholic community, the American public, and the world. 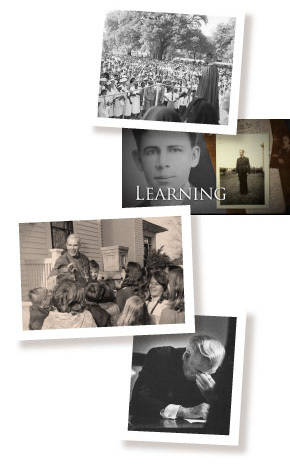 Divided into five main sections, the film uses still images, video footage and interviews with those who knew Sheen to tell the story of this remarkable man, gifted teacher, missionary, priest, and loyal son of the Church. Learning. Tells the story of Sheen’s early years, from birth to ordination, including his early academic and debating successes, which set the stage for his accomplishments to come. The section ends with his ordination and lifelong commitment to the Holy Hour and the Eucharist. Teaching. Begins with his return to Peoria, Ill., and his service as a parish priest. Covers his years as a professor and author, the beginnings of his missionary focus as he traveled the world, and the start of his media career with the Catholic Hour radio show. Preaching. Tells the story of Sheen as director of the Propagation of the Faith and ends with his move to Rochester, N.Y. This section also focuses on the impact of his television show, and his humility in the face of unprecedented popularity. Viewers learn how his speaking style and power to communicate impacted others, from individuals to the world. Giving. Covers his focus on giving — what he did with his incredible wealth from royalties and donations and his dedication to giving both money and time to the less fortunate. Also discusses the impact of his writings and his participation in Vatican II. Suffering. Tells the story of Sheen’s illness, loss of popularity and his reaction to a changing world. Also focuses on his final push to promote the priesthood, his dwindling health and the culmination of his life with an embrace by the Pope.